Students from St Thomas More RC Academy with staff at the clinic which is going to be made more young people friendly thanks to a partnership with Northumbria Healthcare NHS Foundation Trust and Tyne & Wear Citizens. Young people are driving forward a redesign of a mental health clinic. 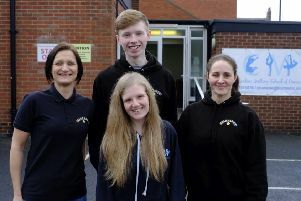 Students from St Thomas More RC Academy have joined forces with Northumbria Healthcare NHS Foundation Trust and Tyne & Wear Citizens to make changes to the clinic at Albion Road Resource Centre in North Shields to make it more young people friendly. The clinic hosts appointments for children and young people up to the age of 18, who are referred to the trust’s Child and Adolescent Mental Health Service (CAMHS). The décor and environment are going to be revamped, age-appropriate artwork displayed and the waiting room is going to be rearranged to allow separate areas. Jim Mackey, chief executive of Northumbria Healthcare NHS Foundation Trust, said: “We’re committed to engaging with our communities and it is a pleasure to be working with the students from St Thomas More RC Academy and ensuring young people’s voices are heard.